ARLINGTON, Va. Defense Advanced Research Projects Agency (DARPA) officials selected Raytheon to complete the development of the agency's Collaborative Operations in Denied Environment (CODE) program during Phase 3. The program aims to extend the capability of the U.S. military’s existing unmanned aircraft systems (UASs) to conduct dynamic, long-distance engagements of highly mobile ground and maritime targets in contested or denied battlespaces. 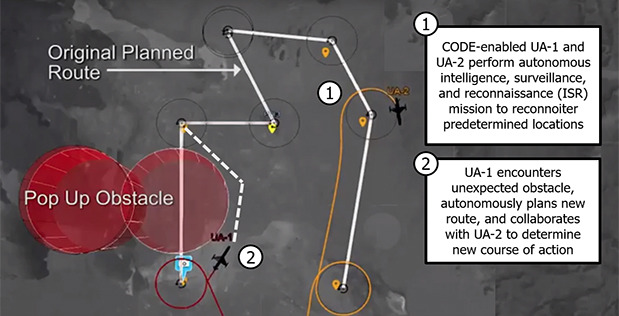 Multiple CODE-equipped unmanned aircraft would navigate to their destinations and find, track, identify, and engage targets under established rules of engagement—all under the supervision of a single human mission commander. “CODE is working to develop a low-cost approach to upgrade legacy unmanned aircraft and make them more effective through groundbreaking algorithms and software that enable them to work together with minimal supervision,” explains Jean-Charles Ledé, DARPA program manager for CODE and acting deputy director of the Agency’s Tactical Technology Office (TTO). To date, the program has conducted Phase 2 flight test series with teams led by Lockheed Martin and Raytheon validating the software open architecture and test-support framework. The teams completed numerous flight tests at Naval Air Weapons Station China Lake in California. The tests flew RQ-23 Tigershark UASs modified with CODE hardware and software to control flight direction, altitude, speed, and sensors.